Bullwinkle and Betty (FCID# 01/20/2019 - 504, 503) are a bonded pair of visually-impaired kittens. Betty, Bullwinkle and their feline friends were rescued from a trailer park. Betty is cute gray tabby tuxedo. Bullwinkle is a black and white tuxedo. Betty's left eye was damaged and had to be removed. Bullwinkle also has vision issues, but not as severe as hers. It is likely Betty can only see shadows, but it does not really alter her ability to get around or play. They gallop around the house and then cuddle together and clean each other before naps. Betty can be skittish while she explores a new place since she does not see well, but with Bullwinkle exploring ahead of her she quickly gets acclimated. They are both friendly and attention seeking. Food must have been scarce for them before because they are very food driven. Meet Betty and Bullwinkle at the Adoption Center located in the Brookhaven PetSmart. 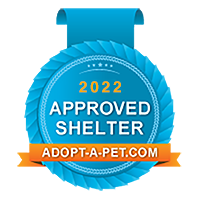 Or you can go ahead and submit a no-obligation adoption application for them here!